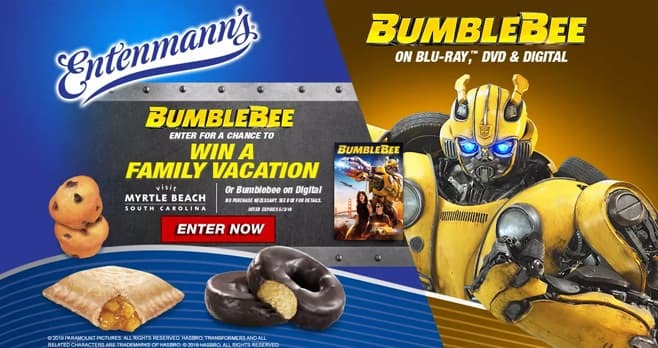 Entenmann’s brings you the Little Bites Bumblebee Sweepstakes and offers you the chance to win a family vacation to Myrtle Beach, South Carolina or Bumblebee on digital. For your chance to win, enter at LittleBites.com/Bumble-bee by May 3, 2019. The Little Bites Bumblebee Sweepstakes is open to legal residents of the fifty (50) United States and the District of Columbia, excluding residents of Alaska, Hawaii, and 21 years of age or older as of date of entry. The Sweepstakes begins on March 17, 2019 at 12:00 a.m. ET and ends on May 3, 2019 at 11:59 p.m. ET. Limit one (1) Entry per person per day for the duration of the Sweepstakes Period. The grand prize consists of a trip for winner and up to three (3) guests to Myrtle Beach, South Carolina. Visit www.littlebites.com/bumble-bee to enter and see Official Rules for details. I am ready to win. On sale. If I could I would stock them all of the time. Please don’t ever stop making them.